You may have noticed I am a terrible blogger who never posts. You would be wholly correct. "Ah, but Emily!" you cry. "It's the summer holidays now! You can't be that busy!" But that, friends, is where you are wrong, because I now, in fact, have a job. This has meant getting up early which has been a wrench. After work I've been writing (oh, the plot, it is coming together! It actually is! Dance with me!) and drawing (because I have an insane amount of art to do for school) and reading (I read A Room with a View by EM Forster which was very beautiful, and now I'm on Shiver by Maggie Stiefvater and can I say ASDFLJKL). I also went to a very lovely wedding. I also went to Oxford. It was pretty much the most beautiful place I've ever been. I was there for the University Open Day and man alive it was marvellous. I really really really really want to study English there. But aside from this lifey stuff I am once again linking up with Ashely G @ [insert title here] for her Summer Writing Camp. I linked up with this in round 2 as well, remember? I know that, normally, I try to differ my post content, eg not posting two stories in a row, but humour me. I will return with bookish posts soon, I promise. NB In England, Year Seven is the first year of secondary school, like Scottish S1 and American ... something. Bear with me. It's when you're, like, twelve. Year Seven. Thomas was getting used to it. The secondary school was worlds away from his local village primary. It towered in red sandstone from the cement ground where hundreds of yelling boys slammed a football around. It had three floors with miles of squeaky linoleum corridor and bells loud enough to split your skull in half. The teachers were nothing like the ones at primary school. They had pointier shoes and higher hair, Thomas thought, and they were vicious with their red pens and their sarcasm. Suddenly there were stacks of textbooks for every subject and acres of homework to do. Most of all, there were thousands of pupils. They streamed through the halls. They shouted in the canteen and overturned chairs. They ran off at lunchtime to buy chips and Mars bars. The older ones smoked cigarettes behind the science block. There was always a ball flying through the air, always a group of girls crammed together for a selfie, always litter skittering around the playground. When Thomas started here there were boys who’d take his lunch money and spill his bag across the rainy ground, and the homework he couldn’t do would bleed red ink into the puddles, making him feel like he’d die of shame. But he was getting used to it now. He’d learnt how to avoid the bullies. He’d learnt how to header the ball when it came flying, and how to please the teachers. He’d learnt where he could sit and where he could walk, and to steer clear of all the places where Year Sevens shouldn’t go, and how to tie his tie in the cool way, and what shoes to wear. At first this was all hard survival. Then he began to enjoy it. There were a lot of good things about Year Seven. There were his new friends, meeting between classes and passing sweets in Maths. There was the Art department, with its huge cupboards spilling with paper and brushes and paints of every colour, and the computer rooms and the great hot canteen. From his first few weeks of being an outsider, Thomas was now one of the boys laughing and shouting, one of the queue at the chippie, one of the ones passing notes in class. There were a lot of good things. The girls at primary school had been loud and annoying. Thomas had spent the majority of his life pretending they didn’t exist. Some of them had come to this school with him. They now wore orange make-up and tiny black skirts, and they’d made friends with lots of other girls as loud and annoying as they. They cackled whenever the boys walked past. Thomas continued to pretend they were not there. Jennifer was not like them. She was friends with them. She went around with them and laughed with them and sat with them, but she was different. Thomas could not explain what he thought about Jennifer – he didn’t know the words for it. But he knew that she was in his mind more than anything else, that he liked her long toffee-coloured hair and her voice and the way she carried herself. That he wanted to be her best friend. He had joined Drama Club because she was there, and he knew he went to sleep every Sunday crackling with excitement, knowing that the next day he’d go to the drama room at lunchtime and she’d be there. Thomas didn’t even like drama. He hated speaking in front of people. He hated pretending, too; he felt stupid acting at emotions. Seeing someone pretending to cry had always made his stomach twinge. But somehow that was different now, because when he act he imagined he was saying the words to Jennifer alone, and then they felt true. None of Thomas’s mates did Drama Club, but there was one cool guy who went, and because he was there, it meant that Thomas could go, too, and not be a nerd. Of course, Jennifer was cool, but it was different for girls. They were putting on a show for the end of term. The drama teacher had written it herself. Thomas though it had too much dancing and not enough plot, but Jennifer adored the drama teacher. She said the play was beautiful. She had blue eyes and they were full of sparks that looked just ready to spill over, the way they always did when she was excited. Thomas like her blue eyes a lot. Like a cinema roll, there were sequences that playing out over and over in Thomas’s head. Most of them involved Jennifer. There was Thomas at Drama Club, delivering an incredible performance while the rapt room watched, with spellbound Jennifer in the centre. There was Thomas playing football, scoring an ace goal as she walked by. Some of the scenes involved saving Jennifer from things: Thomas beating up the gang that tried to take her money. Thomas grabbing her as she slipped on a puddle. In all of them he was three inches taller. There was also one where Thomas and Jennifer went to the cinema. They met in the train station and walked up the street through the pigeons. Thomas said witty things and they shared popcorn and laughed together, and then held hands in the darkness. Thomas was glad that no one could read his mind, and see these thoughts. He also knew that if he were ever to see them as realities, he couldn’t trust fate. Every Sunday night he looked in the mirror and told himself that tomorrow as the when he’d ask her. Every Monday lunchtime his throat went dry and the words remained as silence. After the play, he felt, it would be different. Thomas was in the chorus. His job, the teacher said, was to look theatrical. Thomas had long suspected that he not have a theatrical face, but he tried his best. Jennifer had the lead. She was dressed all in white with glitter in her hair. She almost ran right into Thomas as he left the boys’ dressing room – Mr Jamieson’s Geography classroom, with the desks moved and mirrors wheeled in – and he stumbled. “Sorry, Thomas!” Jennifer said brightly. She was carrying a lipstick and a pair of white shoes. “Hold these!” she said, and thrust them into his hands. Thomas scrabbled to gain a grip. She was already shooting off, glitter showering behind her. Thomas hurtled after her, trying to keep pace. “The thing is—” The sped-walked in time down the corridor. Thomas could feel a tomato blush staining his cheeks. All the words he’d practised were slipping and spilling and disappearing behind him. “What?” Jennifer sounded exasperated. Thomas gulped. “Would you fancy going to a film some time? Maybe? Only if you want—” Thomas bit his lip. His heart was thundering. The fluorescent strip lighting blinked above them as they powered toward the assembly hall. Then the drama teacher loomed, and gave a triumphant cry. Jennifer pulled the shoes from Thomas’s hands. Yes or no. He swallowed. “I’ll talk to you after, OK?” she said. “Wait—” Thomas started, but she was disappearing behind the purple folds of the drama teacher’s dress. The curtain rose on a sea of silence. The lights were down, so only the faces of the first few rows were visible. Then the audience stretched into the unknown. Thomas felt vaguely sick. His costume, he thought, was ridiculous. The material was catching under his arms. The tights were making him sweat. He wished the show were over. He mouthed the words to the songs, dry-throated, worried his cracked voice would be heard if he sang out. It wasn’t easy, this looking theatrical business. Thomas glanced sideways at his other chorus members. They seemed to be making a good job of it. He bit his lip, hoping Jennifer wasn’t looking at him (though part of him hoped that she was). The final scene had always been his least favourite. He had tried not to hate dancing. It seemed easy in his head; there, he saw himself moving athletically with Jennifer beside him. That Thomas was a good dancer. But he was also those three inches taller, and Jennifer said yes immediately when he asked her to the cinema. This Thomas was finding it hard to put one foot in front of the other. His heart was hammering from exertion. A girl had trod hard on his right foot and it throbbed as he dropped into a crouch. Jennifer was singing now: the last song. Her solo. Thomas tried to ignore the pain in his muscles and conjure his most theatrical expression. Jennifer and the piano were out of time. Thomas couldn’t tell if she was too fast or the music teacher too slow, but even he could hear it wasn’t right. Jennifer’s voice grew higher and louder. It rang in Thomas’s ears. His legs were aching, and his nose tickled. Yes or no, he thought. It would have been simple. Why did scenes with Jennifer never play out as he imagined? Why did he map them out over and over, anyway? He couldn’t remember, exactly, the moment when he’d realised Jennifer was different. He hadn’t known he could have these sorts of feelings. It was hard to think about. His head ached. The stage was dusty and Thomas could feel it in his throat. His eyes were watering. The light thumped down and the piano thumped on and his legs were thumping with cramp, and Jennifer’s voice rose higher and higher. The music teacher was racing to catch her up and Thomas could feel his nose itching. His theatrical look had mutated into one of pain. His legs screamed. The frantic overwrought notes died away, and Jennifer, unaccompanied, wailed to the assembly hall. Thomas shook. 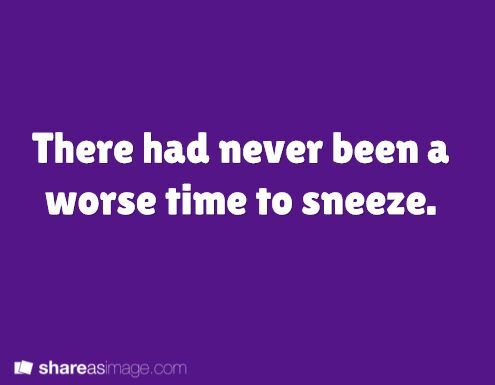 There could never be a worse time to sneeze. A second of silence reigned. In it, he thought, he could feel fury lashing him. Then there was a sound he knew well: his father’s laugh, somewhere in the audience, soon joined by others into a rolling tide of raucous guffaws. Amidst applause that was half mirth, the curtain fell. Dark red, skin burning, Thomas couldn’t choose the more awful: to look at Jennifer, or to stay turned away. Somehow he craned his neck to her, and saw the knives where her blue eyes should have been. She turned and ran offstage. Thomas dropped his head, aflame, his burning eyes shut. He hated Year Seven. I looked it up: Year 7 is like Grade 6, because what you call Year 1, we call Kindergarten. Curious! I thought Kindergarten was like nursery ... geee why can't the world have a unified school system??? I was just about to say the same thing. Year 7 is the 6th grade in the U.S. - the first year of Middle School. Ah yes. I remember reading American books when I was little and they were like "Stanley took a drink from the canteen around his neck" and I was like "wait ... WHAT?" B. WOOO. I don't have a job, I work as a volunteer at a bookshop/charity shop and I DON'T GET PAID UGH but it's awesome because books. Need I say more. C. OXFORD IS SO PRETTY AHH. D. I've suddenly TOTALLY gone off the idea of studying english at uni after researching it a bit more and now I'm so STRESSED BECAUSE I HAVE TO APPLY IN SEP./OCT WHAT DO I DO WHAT ELSE CAN I STUDY THAT WILL HELP ME END UP IN THE SAME PLACE AS AN ENGLISH DEGREE WOULD? B. I'd loove to work in a bookshop. Uni job ambitions. D. NO DO STUDY ENGLISH. But why not? Aw! Poor Thomas. And I really like him too. He's so adorable. That whole third paragraph about Thomas' introduction to Year Seven was so great. I could see it all, especially the older ones going outside to smoke and the gaggle of girls taking selfies. Yeah, I can really see that, and I was home-educated. "In all of them he was three inches taller." I always wonder if shorter guys feel self conscious being around taller girls. Or just self conscious in general. I love how the theater teacher is always talking in italics. :) Very theatrical of her. Seriously though. I really feel for Thomas. He grew on me in this very short story. And it's almost 11:30pm. YOU EXPECT ME TO SLEEP WITH THIS!? What am I supposed to do with my life now? OXFORD IS SO BEAUTIFUL! Why did you mention this? Now I want to go. But I couldn't ever make it all the way there. To Oxford. My golly, it looks like castle. IT'S A CASTLE OF LEARNING! I already love it! (Forgive the American. . .) *takes deep breath* Okay, I am composed again. OK. So in said lost comment I thanked you a lot of times for your very kind words, and said how I think that the story is strongest at the beginning and gets weaker, and also recounted a conversation I had last week with some short male friends of mine. Whatever it is seems partial to your comments. . .
Perhaps. . . I love the ending though! The build-up to it was excellent. Maybe a little drawn out, perhaps that's what you mean. But the ending with him finally asking her, and her not giving an immediate answer, that really bothering him, and then- The sneeze! It seemed so realistic and yet classic all in one. I had to know it was coming because it was in the prompt. But it just really fit. It didn't seem contrived at all. Life is always inconvenient like that. :P At least for me it is. What did the short males say? Why this is a strong point of interest to me, I do not know. But I do have shorter male characters to write. Oxford sounds so amazing! Does having dreads have something to do with Oxford? Although having dreads is pretty cool too. Writing novels, of course, is even better. Yeah, plot is my weakest point. Every now and then I find some rubble to fill the plot holes with, you know, so nobody falls into them. But there are so many to fill! Thanks! Yes, that is exactly what I mean -- I took quite a while to get to the sneeze. I don't know. The story was longer in the end than I intended. But I'm glad you like it! So. About the dreads. I have wanted dreads since I cosplayed as Jack Sparrow in October and braided all my hair and was like YES THIS IS IT THIS IS WHAT I WANT. However my mother is not at all keen on the idea (by which I mean she's violently opposed to it) so I need to wait till I move out. Therefore when I start at uni, my dreads will be new! And I think they are SUPER cool (which is why I want them ... duh) and make one look really arty and interesting, and the image of a girl with dreads writing a novel in Oxford just FITS in my mind. That is what cool looks like in my head. That is what I want. Ugh. So so so many! So much that doesn't make sense! I'm worried about the ending, now. I've been writing this story for so long I've lost my sense of pace and what's exciting and what's not, so I don't know whether I'm maintaining a climax here or if it is all just soggy and rubbish. I just can't tell anymore!